There’s an old saying – if you mess with the bull, you get the horns. 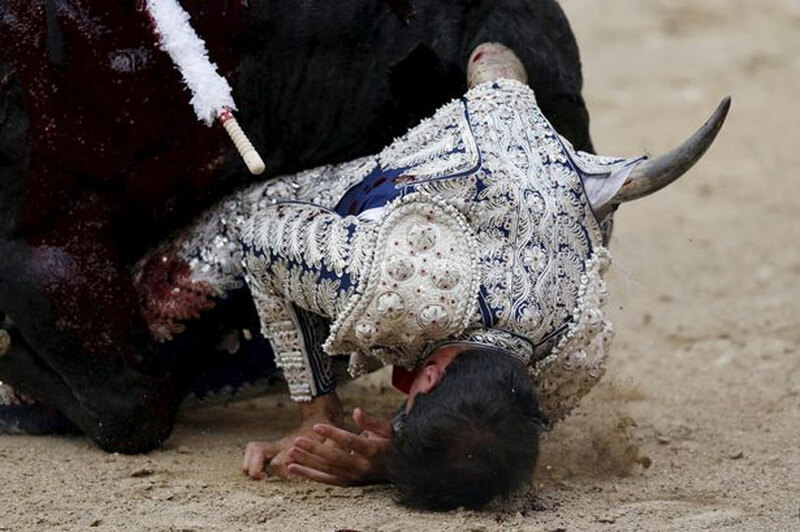 So for this Spanish bullfighter, whose entire job is messing with bulls, the horns were sort of a foregone conclusion. Starting in early May, the Plaza de Toros de las Ventas in Madrid plays host to thirty-one consecutive days of bullfighting, as lithe, agile men face off against beasts that can weight up to a ton, armed with deadly sharp horns and a bad attitude. The practice of bullfighting is as much dance as it is combat, with the matadors angering their animal partners by jabbing sharp sticks into their backs before delivering the killing blow with a sword through the heart. Marco Galan was performing in the fifth fight of the day on June 7th, and had just stabbed his bull with the pair of spears known as banderillas. He went over for a flourish and the bull unexpectedly dropped its head and charged, ramming a horn right into the man’s groin. The crowd audibly gasped as he crumpled from the attack, but he managed to walk out of the ring under his own power as other matadors took care of the bull. He left the plaza and hoofed it to the hospital, where doctors diagnosed him with a gored scrotum, a bruised testicle and a puncture wound in the left leg. They couldn’t save the ball, so had to remove it. No matter what you think about bullfighting, an injury like this is a tragedy. Spare some kind thoughts for Marco Galan, who let the bull get the better of him and walked away one ball lighter.